Author: Robert G. Wright founded the American Anti-Cancer Institute in 2008 after 25 years of private study. He previously had careers in aerospace and business before founding the Institute. I hear this again and again. When a patient is diagnosed with cancer, they feel forced into making immediate decisions on treatment. They are intimidated into thinking that a delay to make a decision will be the cause of failure of the prescribed treatment. Cancer doesn’t occur “overnight.” It is generally accepted that cancer has been present for many years before symptoms or sign develop. A short delay to explore your options is not going to be the cause of a failure. I object to the way that patients are frightened into believing that the only chance they have is with one of the “golden three” … surgery, chemotherapy and radiation. Worse, is the fact that patients are not told that there are alternatives. It is my opinion that, of the three golden three, only surgery seems to be helpful (in early stage cancer) … Chemotherapy and radiation treatments increase your risk of developing a new cancer by suppressing or destroying your immune system. Statistics published on the American Cancer Society Website say that one in two men and one in three women – over 40% of us – will have a “cancer experience.” Very soon that figure will be a full 50%. The way we live, what we eat and drink, the environment we exist in, the toxins we ingest – either by choice or chance – these, in large part, are the reasons we get cancer. The so-called experts want you to believe that genetics play a major role. They don’t! It has become increasingly evident that the food we eat is killing us. Most of us are doing the wrong things by eating wrong foods, living lives largely devoid of real nutrition, adequate hydration and exercise and, instead, filling our swelling bodies with poisons, toxins, proton-pump inhibitors and sugar – then wondering why we have acid reflux and cancer. It simply means that you are responsible – nobody else – for your own health and whether cancer manifests itself in your body. Sadly, we live in a culture that, in many instances, wants to assign blame and does not want to accept responsibility. I ask you to always keep at the forefront of your thoughts the concept that what heals cancer also prevents it; and what prevents cancer also heals it. We are trained to go to the doctor when we believe something is wrong… As a result, we did exactly what he or she said –no wavering, no question, no debate. We trust our doctors (and pharmaceuticals) to heal us when they really have no ability to do so. Contrary to popular belief (and hope), drugs don’t heal people and neither do doctors. Don’t be fooled. Chemotherapy, radiation and surgery cannot heal you – although surgery is sometimes absolutely necessary. The saddest and most tragic part of all is that we’re not only dying of the “disease” now, we’re dying from the treatments. Let’s face it; there is no money in a cure for cancer. And cancer cannot be cured with drugs, surgery, chemo or radiation; not now, not ever, not possible. We know that conventional therapy doesn’t work – if it did, you would not fear cancer any more than your fear pneumonia. Modern medicine, with all its wonderful new diagnostic equipment, surgical techniques and drugs, would have you believe that the tumour is the cancer and if you don’t get it out right now you are done. Not true on both counts. The tumour is a symptom and you almost always have time. You are frightened into believing that surgery and chemical/radiological treatments are your only chance and you must start right now and, second, you are scheduled for surgery, cut open and cut up, told “we got it all” (they never get it all), then set up for chemo and radiation. Your demise has begun. You are told nothing of alternative therapies and, in many instances, threatened if you even consider them. It’s your life – not his (doctor’s) – take charge of it. No one has the right to tell you what to do – especially if you have cancer. That’s a decision you must make for and by yourself. I know for a fact that most of us do not have all the pertinent and correct information to make it accurately or correctly … most people, due to their lack of understanding concerning the facts surrounding cancer and how it is really healed, make the wrong decision. And although it’s not their fault, for many of these, the statistics prove that it will cost them their lives. You must remember this. If you or a loved one ever faces the scourge of cancer, it is your life that is at stake, not your doctor’s. It’s up to you to take control of your own health… Conventional cancer therapy is toxic and dehumanizing, and it doesn’t work. If it did, we wouldn’t fear cancer. But people rush into these therapies that don’t work because they are too scared to do anything else. 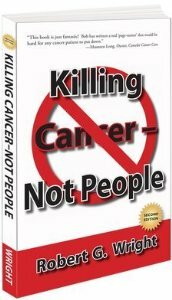 My definition of cancer quackery is the deliberate misapplication of a diagnostic or treatment procedure in a patient with cancer …The culprit who victimizes his fellow man suffering from cancer … all the while greedily enriching himself, is a quack, a criminal, a jackal among men who deserves the scorn and ostracism of society. Because human life is at stake, he must be controlled.